August was slightly above the average as to the temperature. The average temperature reached 18,0°C what is 0,6°C more than the long-term average. The precipitation in August was subnormal. Total precipitation just lightly exceeded the half of long-term average. However, majority of rainfalls came during the first week of August. After July, which was very favourable as far as the precipitaion is concerned, the rainfalls in the beginning of August created very good conditions for finish of the blossoming and maturation of hops. Thanks to these circumstances good hop yield is expected and alpha acid content is estimated to be average. Health state of hop plants varies between very good and bad depending on localities with downy mildew of hops. Especially vegetation near watercourses, in valley locations and places with morning fogs have been damaged. Presently the insect pests do not exceed harmfulness limit anywhere. Majority of the farmers started the harvest between 18th and 20th August and have not finished it yet. 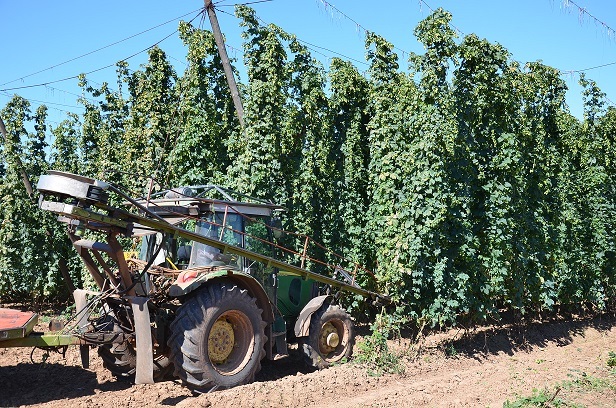 At the most of the hop farms the harvest will be finished in the first decade of September. Top Hop farms use in total 24 combers for hop harvest and 10 kilns for drying the hop.